BALTIMORE, MD -- A judge acquitted a police van driver of all charges including "depraved-heart" murder on Thursday in the death of 25-year-old arrestee Freddie Gray, whose broken neck on the way to the station set off Baltimore's worst riots in decades. Six officers were charged in Gray's death, but only Officer Caesar Goodson was accused of murder. Gray was fatally injured after officers bound his hands and feet and Goodson left him unprotected by a seat belt that prosecutors say would have kept him from slamming into the van's metal walls. Baltimore Circuit Judge Barry Williams delivered his verdict after hearing five days of testimony in the non-jury trial. He also found Goodson not guilty of manslaughter, assault, misconduct in office, and reckless endangerment. Protests and rioting after Gray's death on April 19, 2015 set the city on fire, forcing Maryland to bring in the National Guard. The unrest forced the city's mayor to abandon her re-election campaign, and the Department of Justice opened an investigation into allegations of widespread police abuse. Prosecutors said Goodson was criminally negligent when he failed to buckle Gray into a seat belt or call for medical aid after Gray indicated that he wanted to go to a hospital. But Goodson wouldn't talk to investigators or take the stand at trial, leaving the state with slim evidence of intent to harm. The acquittal of Goodson, 46, is perhaps the most significant blow to State Attorney Marilyn Mosby's efforts to hold police accountable for Gray's death. Last month, the same judge acquitted Officer Edward Nero of misdemeanor charges, and in December, he declared a mistrial after a jury failed to agree on manslaughter and other charges against Officer William Porter. Gray was arrested April 12 after running from an officer on bike patrol outside a public housing project not far from the Western District station house. A neighbor's video showed him handcuffed behind his back and hoisted into Goodson's van. Porter testified that Gray was lethargic, but could breathe and speak, and didn't seem injured. Prosecutors countered that the initial injury became critical as the trip continued. Second-degree "depraved heart" murder, which carries up to 30 years in jail, would mean that Goodson was so negligent in his inaction that he cast aside any consideration for Gray's life. During opening statements, prosecutors for the first time accused Goodson of giving Gray a "rough ride," intentionally leaving him unbuckled "to bounce him around in the back of the van." But by closing arguments, they all but abandoned the theory, saying Goodson's failure to belt Gray in under the circumstances was sufficient to prove the intent necessary for a murder conviction. "Officer Goodson never calls a medic, he never takes Freddie Gray to the hospital," said Deputy State's Attorney Jan Bledsoe. 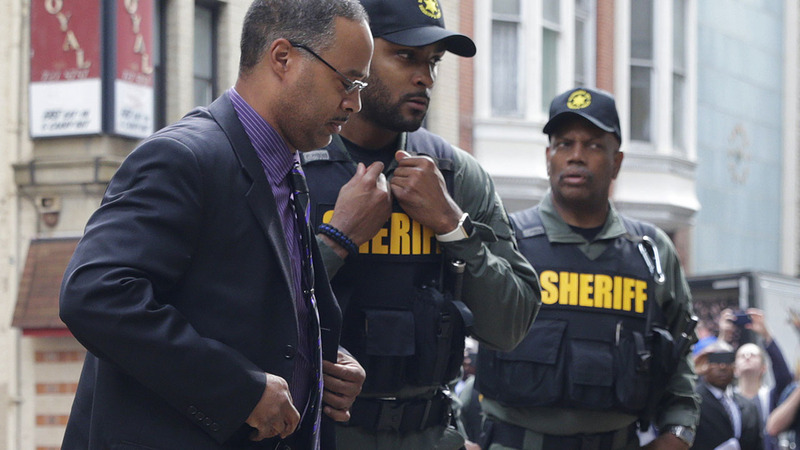 "He has breached his duty, and because of that breach Freddie Gray's life was shortened." The judge seemed skeptical, peppering prosecutors with questions and asking what evidence they had supporting the "rough ride" theory. What if Gray had emerged from the van unhurt, despite being unbuckled, and was found to be falsely claiming injury in order to avoid jail? Chief Deputy State's Attorney Michael Schatzow said the failure to belt him in would still be a crime, although a difficult one to prosecute. Goodson's attorney Matthew Fraling fiercely rejected the allegations, telling the judge that Goodson was a "gentle" officer who didn't buckle him in because Gray was exhibiting "violent and erratic" behavior, citing witness testimony that he was making the wagon shake back and forth by kicking and flailing inside. "They have failed to cobble together any type of case with reasonable inferences, let alone evidence," he said. "The mere fact that harm resulted doesn't mean the Officer Goodson's conduct is the cause of that harm." Goodson's acquittal may impact the remaining cases. Officer Garrett Miller and Lt. Brian Rice are scheduled to stand trial in July on charges of assault, reckless endangerment and misconduct in office; Rice also faces a manslaughter charge. All the officers but Goodson have filed defamation lawsuits against Baltimore State's Attorney Marilyn Mosby and Maj. Sam Cogen of the sheriff's office, who signed the charging documents. The officers claim the criminal charges amounted to false and damaging information.